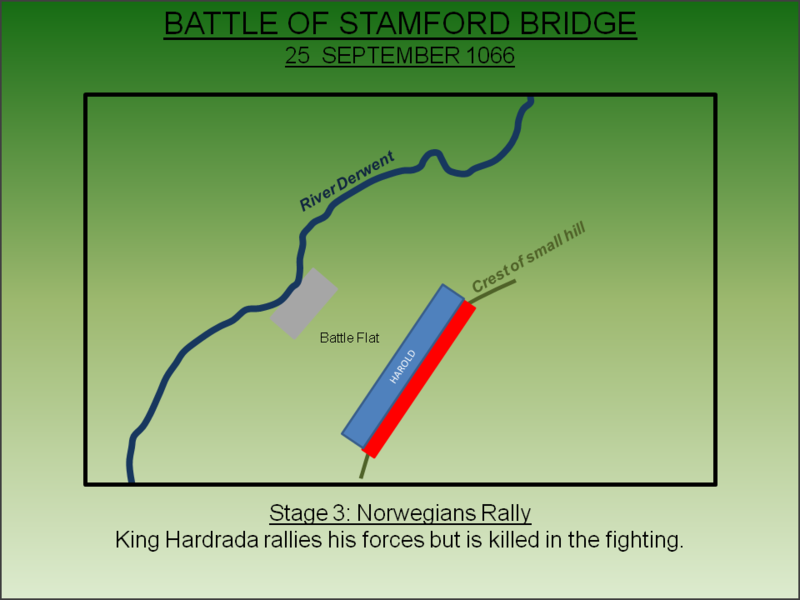 The first of two invasions of 1066 had started badly for the Saxons with a bloody defeat at Fulford but just days later, at Stamford Bridge, King Harold of England surprised the Vikings with a large army. Unprepared for battle and with a significant contingent displaced guarding their ships, the Vikings were routed and the Norwegian King killed. On the 5 January 1066, the English King Edward the Confessor died childless. During his reign he had carefully managed a number of competing claimants to his throne but, on his deathbed, he nominated the most powerful English landowner Harold Godwinson, Earl of Wessex as his heir and successor. This famously enraged William, Duke of Normandy - who had possibly been promised the English throne by King Edward in the 1040s - and who subsequently started invasion preparations that would culminate in the Battle of Hastings in October. However there was another claimant seeking to exploit the situation; Harald Hardrada, King of Norway. Although he had a very weak claim to the English throne – allegedly an agreement had been made between King Magnus of Norway and King Harthacnut of England circa-1040 where each agreed to succeed the other if they died without natural heirs - it is equally possible that this great Viking warrior wasn’t too concerned about legal niceties and simply saw an opportunity for conquest. Allied to Hardrada was Tostig Godwinson, Harold’s own brother, who up to Autumn 1065 had been Earl of Northumbria. He had been ousted by a local rebellion and another northern magnate, Morcar, had been invited to take his place. Despite King Edward supporting Tostig, he was ultimately forced to accept Morcar. The situation didn’t change when Harold became King and Tostig sought to make his claim by force. In May 1066 he sailed from Flanders with 60 ships attacking the Isle of Wight and Sandwich before moving north to Lincolnshire where his small force was defeated by Edwin, Earl of Mercia. With only 12 ships remaining he retreated to Scotland where he was placed under the protection of King Malcolm. Tostig now allied himself of Hardrada and the two made plans to combine forces for an invasion in the north. Throughout the Summer of 1066 King Harold waited in the south of England for the expected invasion of William from Normandy. Summer came and went with no invasion prompting Harold to disband his army; but no sooner than he had he done so news arrived of Harald Hardrada’s invasion in the north. The Norwegian King had rendezvoused in the Tyne with the forces of Tostig and collectively they had a force of at least 300 ships. Sailing down the Yorkshire coast, raiding coastal sites as they went, they proceeded into the Humber and up the River Ouse to attack York. They landed at Ricall, about 10 miles short of the city, but found their approach blocked the northern Earls Edwin and Morcar. 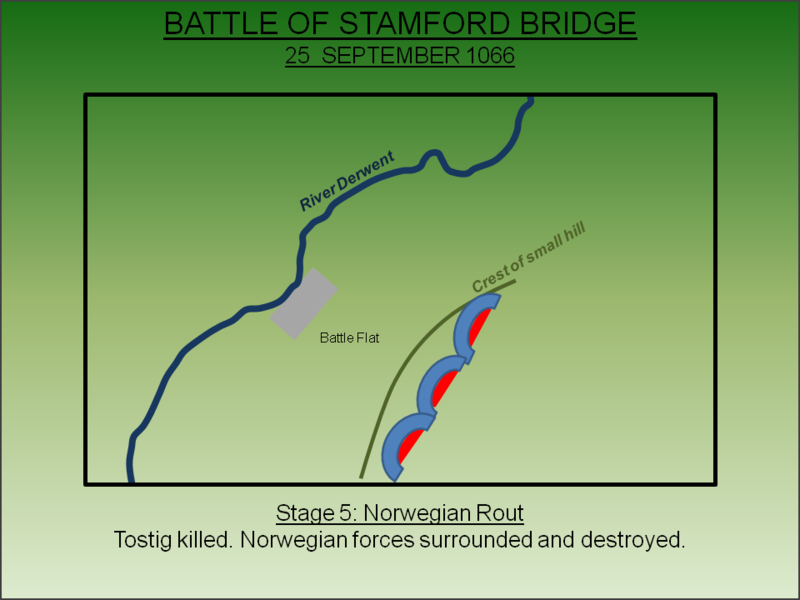 A bloody fight ensued, the Battle of Fulford fought on 20 September 1066, where the Earls attempted to stop the Norwegian King. 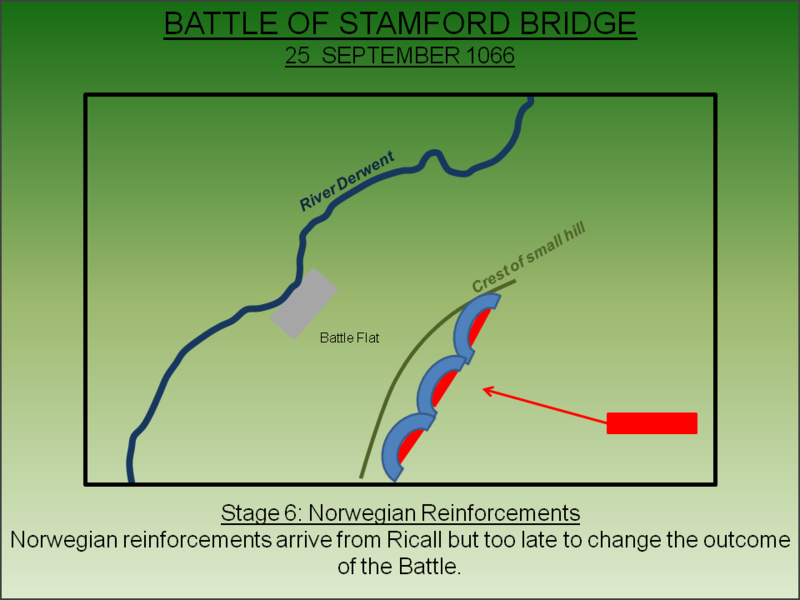 The English lost the battle and York capitulated to the invaders offering hostages and supplies to be delivered to Stamford Bridge; a major junction approximately 8 miles from the city where four Roman roads converged. Harold was still in the south when he heard of the Viking invasion in the north. Re-mobilising his army he force marched his force 185 miles in just six days arriving in Tadcaster, 8 miles from York, on the night of the 24 September. The next day he proceeded to York where he received intelligence that the Norwegians were at Stamford Bridge. He immediately marched out the city along the line of Ermine Street intending to bring them to battle. The Norwegians had no information that King Harold was in the north. Hardrada clearly assumed that the Saxon King would not abandon the south coast when William of Normandy still posed a significant threat. Accordingly, since the Battle of Fulford five days earlier, a significant portion of Hardrada’s forces had seemingly returned to their beachhead at Ricall. Hardrada and Tostig had remained at Stamford Bridge to await the supplies promised by York. On the morning of 25 September 1066, Harold advanced from York along the line of the Roman Road. The size of his force is unknown although is suspected to have numbered around 10,000 men strong. Some historians argue the force was much larger. The size of Hadrada’s force is also unknown although the contingent present at Stamford Bridge when King Harold arrived was probably around half the size of the English forces. They were camped on the ‘battle flat’, an area to the south east of the bridge and village. The balance of Hadrada’s force, possibly numbering up to 3,000 men, was 12 miles away at Ricall with their Fleet on the banks of the River Ouse. 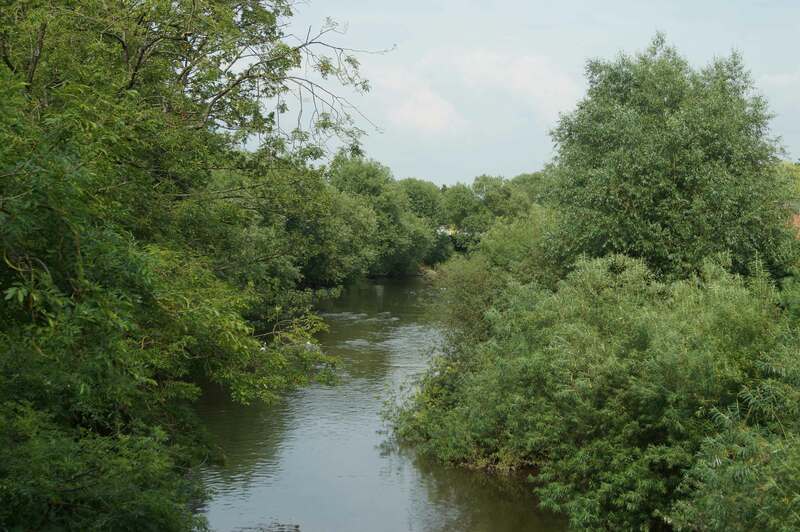 Although the battle takes its name from the bridge, it was really an irrelevance to the substantive battle which took place after the English forces had crossed the River Derwent. 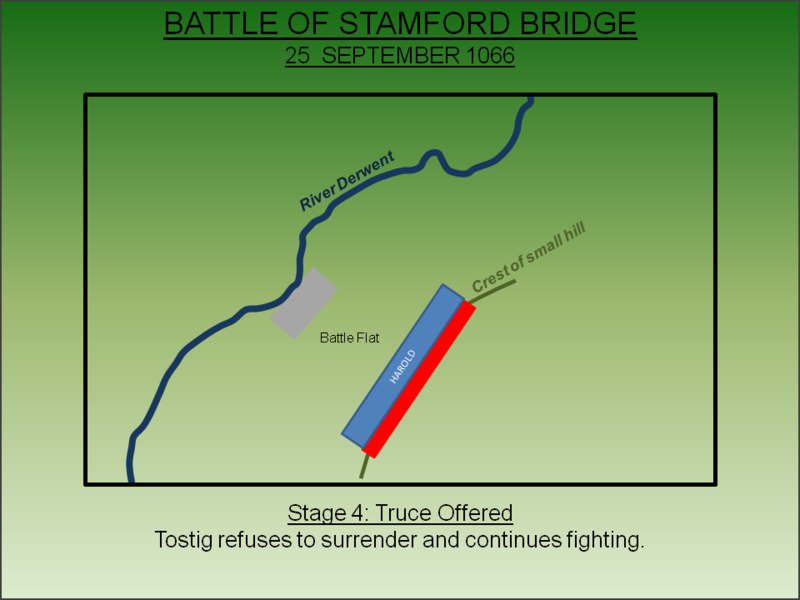 The time Harold came to Stamford Bridge is unknown but he and his forces crossed the River Derwent some, as the name of the battle strongly implies, via the presence of a bridge. 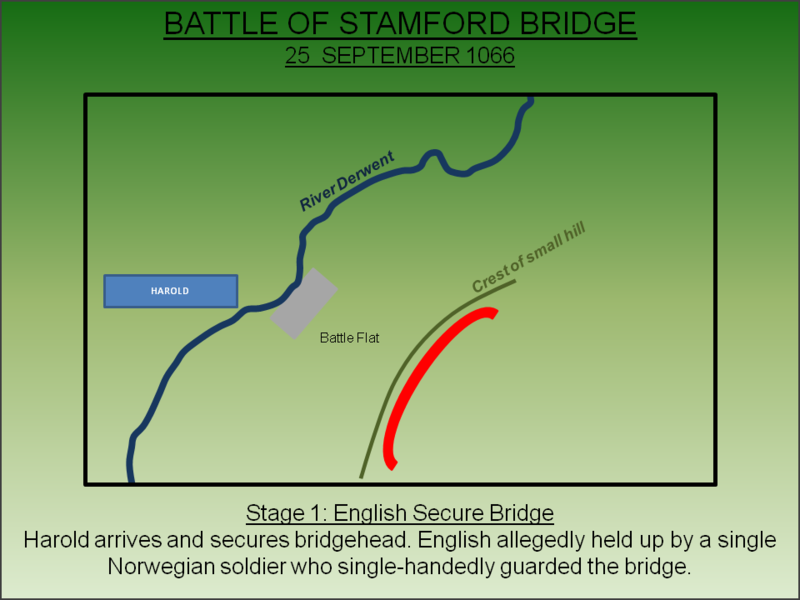 Upon arriving at the scene allegedly one Norwegian stood firm on the bridge against the English forces and single-handedly held off English forces despite being shot by an arrow. It is suggested he remained victorious on a bridge until an English warrior managed to position himself under the bridge and thrust a spear into the Norwegian above. With the warrior dead Harold then crossed with his army. Such a heroic story may be true - either in whole or part - but it had no real effect on the battle. Almost certainly Harold's forces crossed the River Derwent via adjacent fording points as well as by the bridge so the likelihood of delay was minimal. 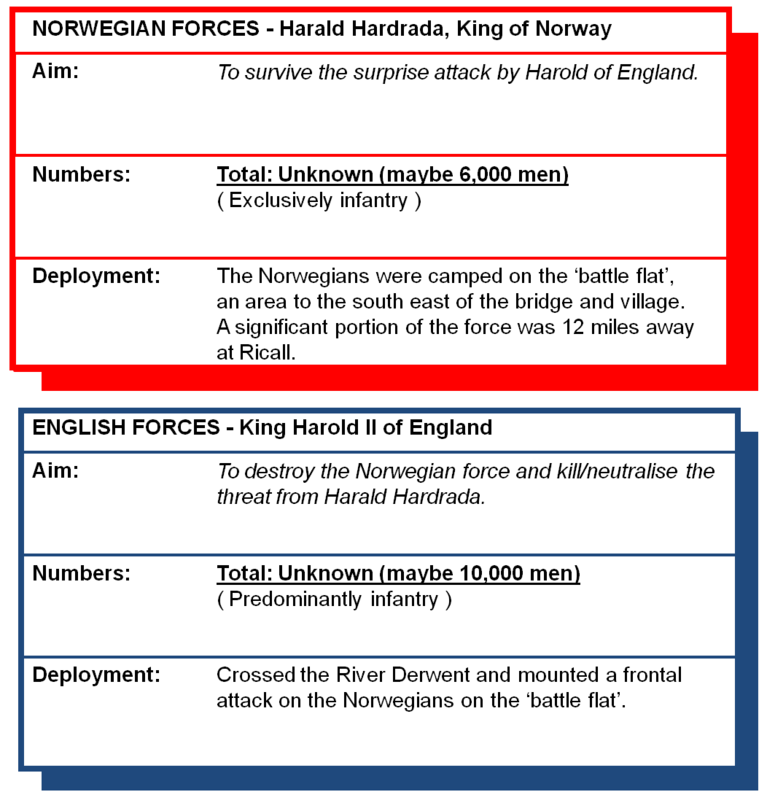 Furthermore one version of the Anglo-Saxon chronicle is quite specific that "Harold, king of the English, came upon them [the Norwegian force] unawares beyond the bridge" meaning at the point of the crossing the forces of Hardrada weren't even yet aware of the English presence. 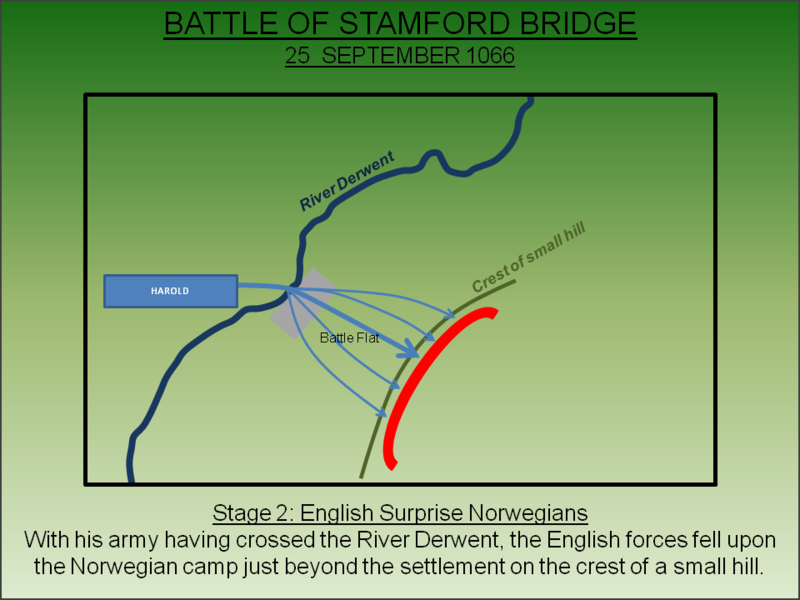 After having crossed the Derwent, the English forces fell upon the Norwegian camp taking them by surprise. Although taken by surprise, Hardrada rallied his men forming them into battle order. However, the English had overwhelming numbers and the Norwegian King was killed early in the fighting. Harold offered an amnesty for Tostig and the remaining survivors but this was rejected and the battle resumed. A fierce fight followed with the Norwegian army now led by Tostig. The Norwegians were hopelessly outnumbered and stood no chance. Tostig was killed with the Anglo-Saxon Chronicle noting "he fell there with glory and a good reputation". The remainder of his force was surrounded and destroyed. The final phase of the battle commenced as Norwegian reinforcements, possibly numbering several thousand, arrived. Led by Eystein Moorcock, who had been left in charge of the ships, they fought fiercely and the English suffered heavy casualties. 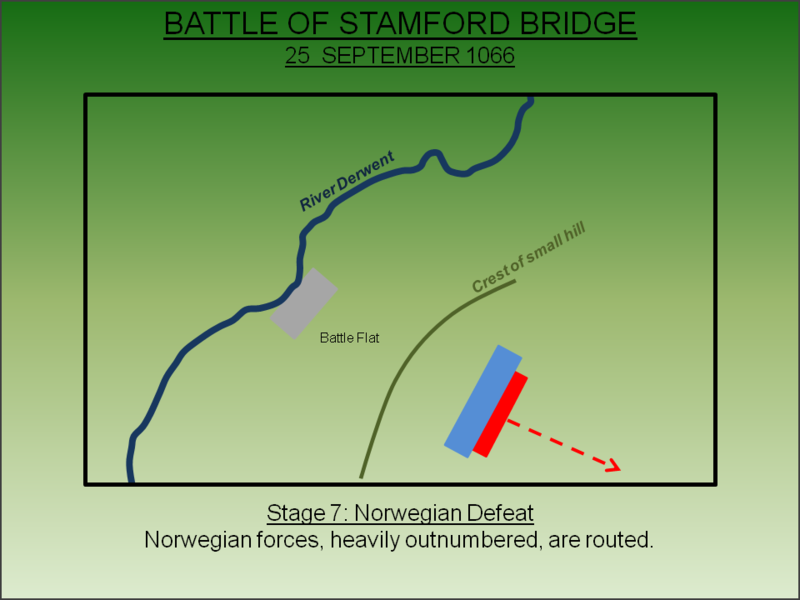 The Norwegian reinforcements arrived too late to tip the balance; the English numerical superiority prevailed, Moorcock was killed and the final Norwegian force was also routed. Harold allowed Harald Hadrada's son, called Mundus, to return to Norway with his ships and the surviving soldiers on the promise that his forces would never invade England again - a promise that was kept. But undoubtedly the greatest impact of the Battle of Stamford Bridge was the opportunity it afforded Duke William of Normandy in the south of England. Just three days after the battle William made an unopposed landing at Pevensey and had over a fortnight before Harold, whose military force must have been heavily degraded by losses to his elite Housecarls, was in a position to counter him. By then William had established castles at Pevensey and Hastings and was ready to move inshore to challenge Harold. The subsequent Battle of Hastings, fought on 14 October 1066, brought the age of Saxon England to an abrupt end. Burne, A.H (2005). Battlefields of England. Pen and Sword Books Ltd, Barnsely. Carruthers, B and Ingram, J. Anglo-Saxon Chronicle: Illustrated and Annotated. Pen and Sword, Barnsley. English Heritage (1995). Battlefield Report: Stamford Bridge (1066). Swindon. Gibbs-Smith, C.H (1973). The Bayeux Tapestry. Cavendish, Leicester. Lancaster, J.H.D (2014). Stamford Bridge: Battlefield visit notes and observations. CastlesFortsBattles.co.uk. McLynn, F (1999). 1066: The Year of the Three Battles. Pimlico, London. Ordnance Survey (2015). Stamford Bridge. 1:1250. Southampton. Schofield, G (1966). The Third Battle of 1066. History Today, London. The river side element of the battlefield is now extensively developed and part of Stamford Bridge village. Unsurprisingly the medieval bridge has long since been replaced. The substantive battlefield, situated beyond the village, is now farmland allowing the terrain to be appreciated but in 1066 would not have been cultivated. River Derwent. The forces of the Saxon king advanced over the River Derwent by the bridge and at least one ford. Allegedly one brave Viking single-handedly held back the Saxons until a spear was thrust into him from underneath. Monument. 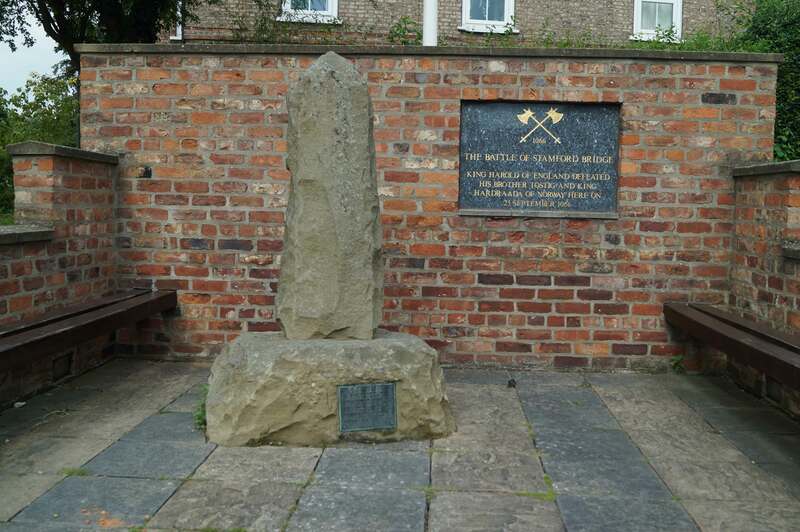 A small monument was erected to mark the battle although this is positioned in the village rather than at the scene of the fighting further uphill. The crest of the hill beyond the bridge where the substantive battle was fought. The Vikings were engulfed by the English. 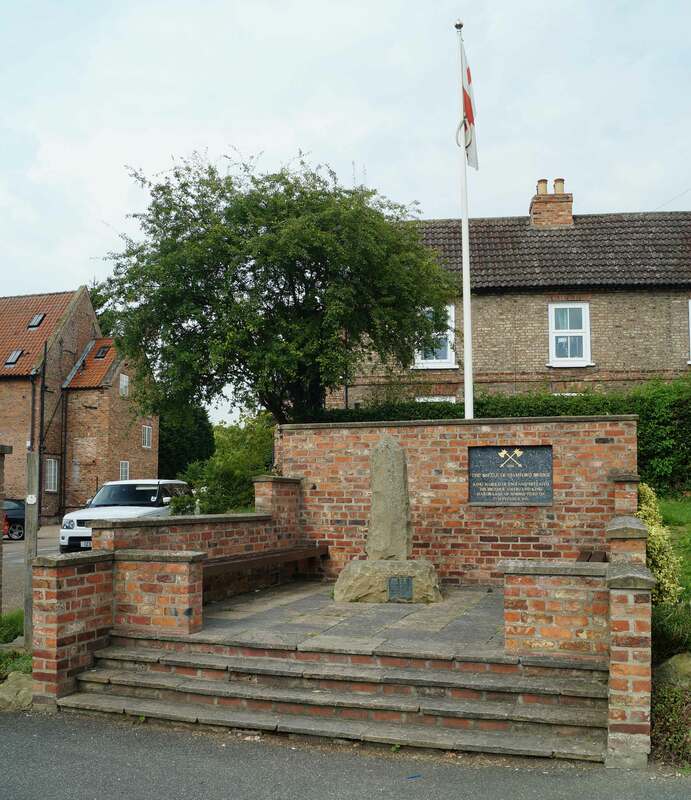 The memorial is found in Fulford Parish Council Playing Field directly adjacent to the A19. The Germany Beck runs to the north of this field. There is a small car park on a turn-off from A19 directly opposite the park (sign-posted parking).